The airbag system is an important part of all modern vehicles. Being an essential safety component of your vehicle, the advanced designs aim at improving the safety of the passengers in times of accidents. The Airbag control unit is basically responsible for computing and processing the signals generated from the airbag sensors as to when and at what pressure the airbag should be inflated during the time of the collision or frontal impact. The airbag control unit is the computer and the brain of the airbag system of your vehicle, without which the sensors are also useless. Without a properly functioning airbag control unit, you are in danger of severe damage at the time of an accident. In some cases, the airbag light on your dashboard will be illuminated even when there hasn’t been an accident. Usually, in such cases, it is due to a faulty airbag control unit, or because of data corruption, damage or water exposure an error is generated in the control unit internally. Such errors can be generated or the airbag control unit can go bad if the water has entered the system or if there has been a short circuit. Since the control unit is a typical electronic circuit with a board, ICs, and various chips, it is recommended that the airbag control unit part is replaced with a new one when it has been verified that the part has gone bad. It would generally need technical knowledge for the diagnosis and repairing of the airbag control unit, and there can be more problems than one within the circuit. Therefore, for best performance and functionality, you should rather go for a replacement. The average replacement cost of the airbag control unit is between $3000 and $5000. However, the pricing usually varies depending on the car model and make. The replacement process of the airbag control unit can be tricky due to its sensitivity. Therefore, you need to take certain protective measures in order to not increase the overall replacement cost. Basically, the airbag control unit cost will depend on how many parts associated with the airbag control unit you are going to replace along with it, as you may require to replace other things as well in certain cases. Apart from that, each vehicle may use a different kind of airbag control unit, and the cost of the parts will also differ with each car. Moreover, the labour costs involved with the replacement of the airbag control unit will also be significant if you are not doing it by yourself. An expert may take a couple of hours or even more to replace the control unit fix everything correctly. That is something which can increase the labour cost as well. The airbag control unit can be brought as a brand-new unit or a used control unit may also be available in the market for your car. If you are going for a new one, you can easily expect to spend more than a grand on the parts, while the cost may drop a few hundred dollars if you are buying second hand. What is an airbag Control Unit? The airbag control unit can be considered as the most important part of the airbag system, or the brain of the airbag system that is installed in your car. It is the primary hub where all the sensors and other components of the airbag system are connected, including the pre-tensioners on your seatbelt, the collision and the frontal impact sensors, the airbag itself and other components. It is like the motherboard and the computing processor of the airbag system that receives the data from one end, processes and evaluates it, generates the commands and sends the signal commands to the respective components. The data and information on the collision are detected and recorded by the airbag sensors. However, what is needed to be done to that information is the decision that the airbag control unit has to make. The data from the sensors is transmitted to the airbag ECU or the control unit, which analyze the readings and generates the most appropriate safety command as a response. The ECU of airbag system will analyze the crash speed readings and the area of impact to decide whether or not the impact of the collision is hard enough to inflate the airbags. In latest vehicles, the airbag control unit will also generate commands to stop the engine and cut off the fuel supply as a preventive measure. The airbag control unit in some modern vehicles will also cut off the battery connection so that the battery is disconnected for improved safety purposes at the time of an accident. 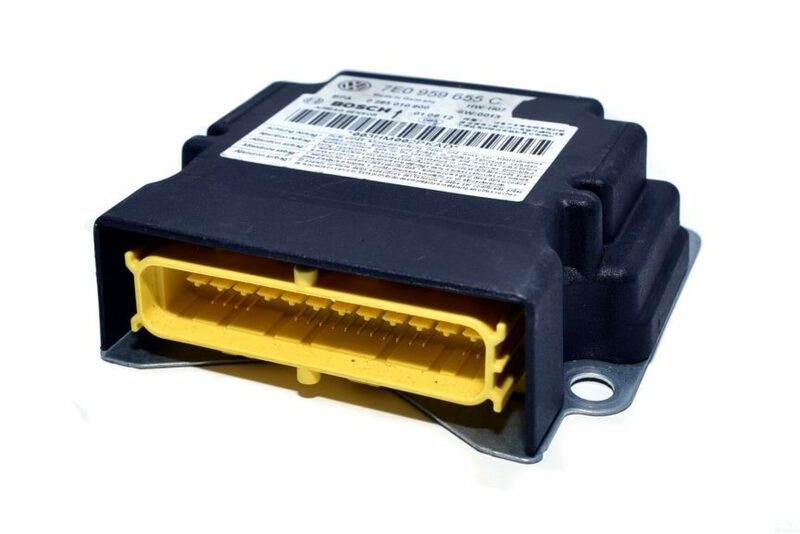 The airbag control unit module can connect as much as six sensors to it in some vehicles, such as rotational speed sensor and tee acceleration sensor. The control unit can also smartly receive and compare the signals and information received from the other sensors to evaluate when the airbag should be inflated. It can also send signals to turn on the interior lights and the hazard lights. The core functionality of the airbag control unit it to protect the passengers from the rear and the front impact during the collision. The modern airbag control units use the SPEED platform approach as the latest safety concept. For mass production, computerized efficiency, the improved safety and economical cost of the SPEED platform make it a much reliable and better option in the airbag control unit manufacturing. Where is the airbag Control Unit located? The exact location of the airbag control unit can greatly vary with each vehicle depending on the type, the design and the preference of the manufacturer of your vehicle. Typically, for most of the vehicles, the location of the airbag control unit will be within the proximity of the gear-stick in the rear or front area. It can be under the handbrake lever as well. In some vehicle designs, it can be designed as a glove box within the proximal area of the gear stick or the handbrake level. It can sometimes be under the passenger seat or foot-well. In other cases, the airbag control unit can be found under the center console or on the floor under the radio. You may also find it under the carpet of the front passenger seat or driver’s seat on the floor. Sometimes it can be difficult to detect the exact location of the airbag control unit in your vehicle especially if you don’t know how the Airbag control unit of your vehicle looks like. Therefore, it is recommended that you refer to the service manual that is provided to you by the manufacturer of the vehicle with the details about the location of airbag control unit in your vehicle. Otherwise, you may need some help from an expert or a mechanic for locating the control unit for the airbag system. Replacement of a failed airbag control unit is a sensitive and risky business. If the guidance instructions are not followed correctly, it could lead to life-threatening situations or accidentally cause the airbag to inflate all of a sudden. That is why the diagnosis or the replacement may lead to severe injury or even death, and it is extremely important to take proper measures while replacing the airbag control unit. The procedure would obviously include first the removal of the previous airbag control unit and installation of the new one. Here are a few steps that you should consider while replacing a bad airbag sensor. • Acquire all the tools you will need for the replacement. • Locate the airbag control unit with the help of the service manual. • Make sure that the vehicle is parked on a completely flat surface and not elevated or lifted with jacks. • Do not disassemble or interfere with the pretensioners, retractors, safety inflators, or adaptive load limiters. • Always turn off the ignition. • Always remove the battery entirely and wait for a few minutes. • Locate the SRS module. • Unplug and disconnect the airbag control module. • Install the airbag SRS components properly before replacing the airbag control unit. • Make sure the clock spring, airbags, impact sensors and the seat belts are properly installed. • Remove all the bolts and ties that are mounting the control unit. • Install the new one in the right place and put the bolts on it. • Replace and connect all the connections that you removed from it. • After connecting everything back, finally, connect both the battery cables that you removed. The diagnosis of an airbag control unit is usually not recommended to be done yourself in terms of testing it with electrical probing or other means unless you have strong technical knowledge as it can be very dangerous. The very first indication that you will see will occur on the dashboard as the airbag light will turn. In some cases, it can be illuminated in a certain way and the difference of the light behavior can be a signal or a code that can be referred to in the service manual that is provided by the company to the user. It may light up or blink, it may blink once, twice, thrice, continuously, or pause. Each type of blinking corresponds to a signal for a certain problem. The other sings include the airbag not working at the time of an accident, which is when you should definitely get the things checked. Using the multimeter or electronic testing device can be dangerous for airbag control unit testing. Therefore, it is recommended to avoid it. By accident, if you inflate the airbag it can cost you three thousand dollars or even more. Sometimes other components are also required to be replaced while replacing the airbag control unit.